DoradoStrip 3031 Architectural Paint Remover effectively lifts urethanes, lacquers, latexes, alkyds, elastomerics, and varnish. DoradoStrip 3031 Architectural Paint Stripper, a low VOC, is recommended for use on architectural surfaces such as wood, brick, and masonry where non-lead based paints are present or in any area where damage to delicate equipment may be a concern. It contains no TAPs or HAPs, is non-flammable, does not affect glass or Plexiglas, is non-ozone depleting with low odor, is easily sprayed with standard equipment, with easy clean up using soap and water or denatured alcohol. Recommended usage includes brick buildings, log homes, elastomeric coating removal, graffiti on porous surfaces, any non-lead based architectural coating removal or any area where abrasive blasting is not an option for environmental, economic or surface damage may be of concern. 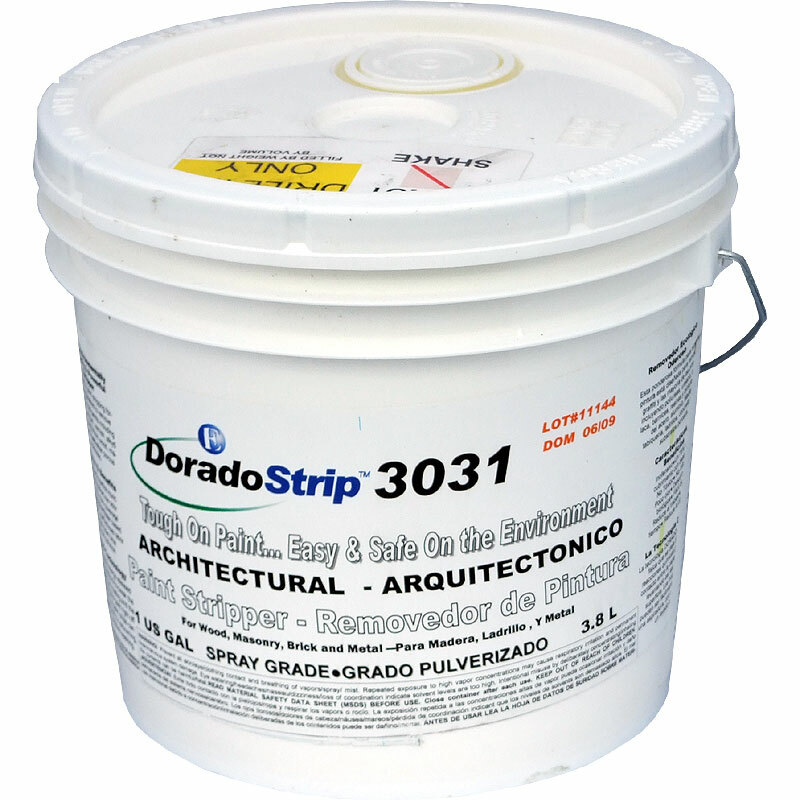 DoradoStrip 3031 is recommended for use on Concrete Floors to remove urethane coatings. This product is not approved for aviation use! 40 - 75 sq. ft., per container. I liked this product and found even the high price worth it. Other products are so toxic that you feel like you are compromising your heath by using them. You do need to let the product sit for some hours before working away, but then it really ripples right off. We are working on 100 year old layers of paint. Sometimes took two rounds. But again nice to not be worried that what you are breathing is so damaging and if you get a splatter on your skin, it’s no problem. I'm restoring an Airstream and it works great. I highly recommend the product for cleaning your aluminum. Excellent product. Seemed expensive until I compared price of bulk gallon to that of other safe strippers available at local hardware stores by quart only. Overnight dwell time lifted 3 to 5 layers of paint at a time, the oldest of which had been on our wooden door x 90 years. Was dismayed when final lift-off left a finely hazy paint film on bare wood, but a quick wipe with water-dampened towel removed it. Appreciate that this is a no-fume, nonflammable, and skin-friendly product. Highly recommend it & would never use anything else in future. Results comparable to those of the now-unavailable RemovAll, the previous gold standard safe stripper. Used this to remove paint from a 64-year-old exterior door. There were multiple layers of paint and it had cracked and bubbled. It took multiple applications and removing the paint layer by layer, but it worked. I used the entire container on one side of the door. This took about 6-8 hours of applying it and letting it sit awhile to work. My painters did this job and so we did not have the luxury of letting it sit overnight, so it might have worked better if we had done that. I would buy the product again and overall was pleased with it. Works great for taking clear coat off Airstream trailer. Used high pressure setting on garden hose valve and came right off. Not messy like some products.